Home Finance Does It Really Matter Which Rewards Card You Get? We write about credit cards a lot at Money Under 30—which ones offer the best deals, the most favorable terms, and the most generous rewards. It’s not that these questions aren’t important, or that you shouldn’t do research before selecting a card. But close analysis reveals that—in terms of reward yield—your choice of a rewards card doesn’t matter all that much, especially if you’re looking exclusively at cards with no annual fee. Premium cards change things a little—but only a little. One card may offer a little more for a certain category, or give you a special rate for a certain period of time, but most of them are going to offer comparable total rewards over the course of a year, assuming you’re spending as you normally would. When signup bonuses are factored in, average return goes up, with some lackluster cards getting a major boost. This makes sense: There’s a limit on how much credit cards are willing to give you, and it probably doesn’t vary that much from company to company. A super generous signup bonus will be offset by a less generous reward yield, and vice versa. A lot of credit card reviews start from faulty assumptions—like presuming you’re going to max out quarterly categories—when comparing cards. They tell you what you could earn, not what you’re likely to earn. We should know—we’ve done it, too. But let’s be real: Most of us are relatively consistent in our spending habits, and upping our expenses just to get five cents back on every dollar is unquestionably foolish. What does the average 20-something person actually spend? Let’s start with some data on what an average young person spends in a given year on the most common rewards categories: gas, groceries, and restaurants. Our Hypothetical Millennial drives about 15,098 miles a year, in an average car that gets about 36.4 miles to the gallon, and fills their tank with a gallon of gas that costs about $2.21 cents. That works out to about $916.66 in gas purchases per year. According to the USDA, Hypothetical Millennial spends about $275 a month on groceries, or $3,300 a year. According to Restaurant Marketing Labs, millennials spend $174 at restaurants each month, or $2,088 a year. That brings HM’s total expenses across these three categories to $6,304. Just to make it interesting, let’s throw on an additional $200 in non-special-category expenses, to a total of $8,704. What will the most popular cards give you for average spending? Chase Freedom has rotating quarterly categories that yield 5 percent, and while there’s some variation, the categories almost always include gas, groceries, and restaurants. The categories are limited to $1,500 per quarter. All other purchases earn an unlimited 1 percent cash back. The current quarter (Jan – March 2019) will feature five percent cash back at gas stations, drug stores, and tolls. Gas spending: For gas spending, the quarterly total is $229.16, yielding $11.46 in rewards, with $687.49 left for the rest of the year at 1 percent, garnering another $6.87 for a total of $18.33 in gas rewards for the year. Groceries: Using the same math, groceries will get you $41.25 during the 5 percent period, and $24.75 for the rest of the year, bringing the total to $66. Restaurants: Restaurants will yield $26.1 in rewards during the special quarter, and another $15.66 for the rest of the year, bringing the total to $41.76. Non-category spending: The additional $200 in non-category spending ($2,400) earns another $24. Signup bonus: $150, after spending $500 over three months, which is totally feasible with this spending. Discover it® Cash Back offers 5 percent back on quarterly categories that you activate, up to a quarterly maximum, and unlimited 1 percent back on all other purchases automatically. At the end of your first year as a card member, they will match your total annual cash back. Obviously, you might be able to buy groceries at Sam’s Club or Amazon, which is why the choice of a rewards card is personal. If you’re a heavy Amazon user, and have Amazon Prime, then this could increase your cash back even more. The average Amazon Prime User spends $1,500 a year on the site. Groceries: When groceries are part of the 5% category (Jan – March 2019), you’ll net $41.25; for the rest of the year, you’ll net $24,75 for a total of $66 for the year. Restaurants are gonna get you the same yield they did with Chase Freedom, of $41.76. Gas will also net you 2 percent for the entire year, or $18.33. Amazon: The two quarters of Amazon purchases (presuming $1,500 a year, or $350 per quarter), will get you $37.50. Non-category: If we include Amazon purchases in the “non-quarterly-category” spending, that leaves $1,650 ($2,400 – $750), which yields $16.50. Chase Freedom Unlimited offers 1.5 percent cash back on all purchases, with no limit. Total spending of $8,704 with 1.5 percent back yields $130.56. Signup bonus: $150, if you spend $500 within 90 days of card opening, which is doable with this level of spending. 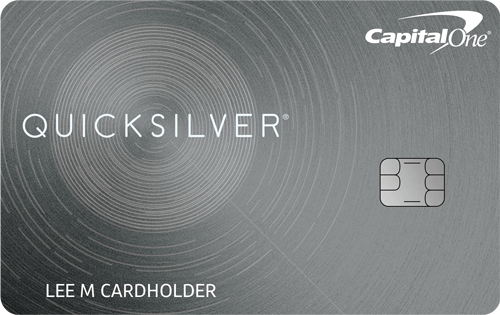 The Capital One Quicksilver Cash Rewards Credit Card also offers 1.5 percent cash back on all purchases, with no limit. Total spending of $8,704 with 1.5 percent back yields $130.56. Applicants who cannot get approved for a prime cash back card, however, might consider the Capital One QuicksilverOne Cash Rewards Credit Card—a version of this card designed for applicants with limited credit. Signup bonus: $150, after spending $500 in the first three months. This card gives you 1.5 points back for every dollar spent, plus an additional 10 percent bonus if you also have a qualifying Bank of America® checking or savings account. That 10 percent bonus brings your overall yield up to 1.65 points per dollar spent. That brings your total on annual spending of $8,704 to $143.62. Signup bonus: 25,000 bonus points, worth $250 in travel, if you make $1,000 in purchases within the first 90 days. On the surface, the Citi Double Cash card would seem to be the best cash back credit card on the market. This no-annual-fee card gives you a total of 2 percent cash back on every purchase—1 percent when you make the purchase and another 1 percent when you pay off the charge. Unlike competing cards, however, the Double Cash card does not offer a signup bonus. And that actually matters. In our example, you would need to use the Double Cash card for between four and five years to begin to do better, overall, than some competing cards with signup bonuses. 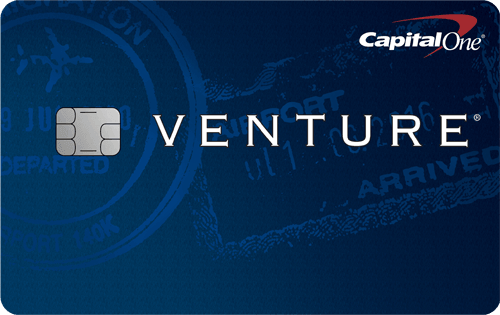 The Capital One Venture Rewards Credit Card has a $95 annual fee, but waived the first year, it’s a modest one. The card pays double miles (2 percent) back on every $1 spent and has a sign-up bonus worth $400 if you can spend $3,000 within three months of approval. That would be a stretch based on the annual spending of our Hypothetical Millennial, but if it can be done, the $400 bonus goes a long way toward increasing the value of this card. Rewards must be redeemed for travel, but can basically be used like cash when redeemed as a statement credit toward any travel purchase you make with the card. The double miles will get you $174.08 in rewards the first year, but in subsequent years you’ll have to subtract the annual fee and will be left with $79.08. Signup bonus: 40,000 bonus miles, worth $400 as a statement credit toward travel, if you spend $3,000 within three months of approval. The Bank of America Cash Rewards ® credit card gives you 3 percent back on your choice of category, 2 percent back on groceries and at wholesale clubs, and 1 percent back on everything else. Bonus cashback categories are limited to $2,500 spent on your 3% category, at grocery stores and wholesale clubs per quarter, which doesn’t affect our calculations. Gas: Three percent back on gas purchases (for example) yields $27.50. Restaurants: The Bank of America® Cash Rewards credit card offers 1% cash back at restaurants UNLESS you use your 3% category on it, so that $2,088 in spending yields $20.88 OR $62.64. Non-category: The additional $2,400 in non-category spending would yield $24. Signup bonus: $200, after spending $1,000 within 90 days of card opening, which is easy to do with his level of spending. Gives 3 percent on groceries, 2 percent on gas, and 1 percent on everything else. Rewards are redeemed as a statement credit. Signup bonus: $100 after you spend $1,000 within 90 days of opening your account, which is doable with this level of spending, though more of a reach than cards that require only $500. The big sibling of the Blue Cash Everyday, the Blue Cash Preferred offers 6 percent back on grocery purchases, 3 percent back on gas (as well as on select department stores), and 1 percent back on everything else. Like its little brother, it dispenses these points as a statement credit. 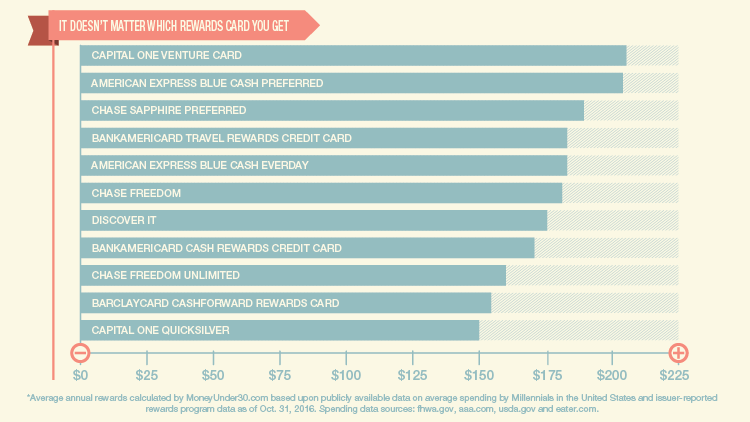 American Express recently increased the annual fee on the Blue Cash Preferred to $95 (from $75). Non-category: $24 for other purchases. That brings your total to $270.38. When you subtract the $95 annual fee, you get a net yield of $175.38, only about $13 more than its no-fee brethren. It’s also got a slightly higher signup bonus of $150 after spending $1,000. One thing to note about both the Everyday and the Preferred cards: The grocery rewards are only available at “select” stores, usually supermarkets, which could limit your rewards depending on your shopping habits. Signup bonus: $150, if you spend $1,000 within 90 days of account opening. The Chase Sapphire Preferred is beloved by the travel hacking set. For a $95 annual fee, you get two points back for every dollar spent on travel and dining, and one point per dollar spent for all other purchases. The travel category, however, does not include fuel purchases. We’ve already established that the 5-percent quarterly category cards average out to 2 percent back on the course of the year. Thus, the Chase Sapphire Preferred would get you $41.76 over the course of a year, the same as Chase Freedom and Discover it® Cash Back. Everything else falls into the 1 percent category, which comes to $6,616, or $66.16 in rewards for the year. All together, you get $107.92, barely enough to cover your annual fee. If you use your points to book travel through Chase Ultimate Rewards, your points are worth 25 percent more than they would be if you just redeemed them for cash. That $107.92 would then be worth $134.90. You’ll have to subtract the $95 annual fee, giving you a total net rewards of just under $40. However, if you’re able to reach the $4,000 in spending required to get the signup bonus of 60,000 points ($750 in travel booked through Chase Ultimate Rewards), then your average annual rewards over your first five years become competitive at $191.88. But spending that much money in three months will be a challenge for someone with average expenses. Our Hypothetical Millennial will spend just over half that in three months, or $2,176.14. Clearly, you’ll do better with this card if you have above-average travel spending, but everyone else can keep looking. Signup bonus: 60,000 points ($750 in travel if booked through Chase Ultimate Rewards) if you spend $4,000 in three months, which would require considerable additional spending. There’s a lot of hype surrounding rewards cards, with every company trying to edge out the competition by fractions of a percent. But yesterday’s best deal will be passé by tomorrow, and the differences in annual average return between cards often don’t amount to all that much. The best premium card beats the best no-annual-fee card by less than $2 a month. The 1.5 percent cards generally underperform the 5-percent quarterly category cards. A big signup bonus can make up for lackluster rewards, and vice versa. Five percent in one quarter, and 1 percent in the other three averages out to 2 percent over the whole year. Pick a card that will be convenient, and that blends seamlessly into your life (i.e. if you’ve got a Bank of America® checking account, the Bank of America® credit cards are a better deal), and rewards you for what you shop for most. Pick one that’s accepted (almost) everywhere you want to shop. Of course, if you’re looking to get the most bang for you buck, you’ll want to mix and match these cards. But if you want to keep it simple, and track all your purchases on one card, then don’t stress about which one you pick.